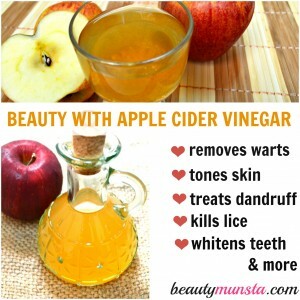 20 Beauty Benefits of Apple Cider Vinegar - beautymunsta - free natural beauty hacks and more! 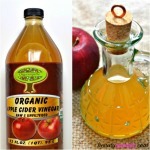 Apple Cider Vinegar aka ACV is might be the latest natural frenzy in today’s world but its no new thing at all! Get this – ancient Egyptians, Greeks, Romans and Persians have all used ACV for its medicinal and healing properties. Text from ancient Egyptian urns describe the healing properties and benefits of apple cider vinegar for the human body. This was text dating as far back as 3000 BC! Hippocrates himself used ACV as a healing elixir to treat a myriad of health conditions including skin problems. What makes apple cider so invincible? Check out 20 beauty benefits of Apple cider vinegar. Apple cider vinegar is great for all skin types! Even though it is acidic in nature, ACV actually helps maintain our skin’s natural pH. ACV deep cleanses skin pores from within, removing excess dead cells, excess sebum, dirt, grime and pollution. Mix 1 teaspoon raw and organic ACV (with the mother) with 2 tablespoons pure water and use a cotton ball to wipe your face. Take care not to bring the ACV close to your eyes and damaged skin. Rich in anti-oxidants and alpha hydroxy acids, apple cider vinegar has natural skin bleaching agents that can help lighten age spots. The antioxidants in apple cider vinegar will also help slow down the aging process of skin by fighting off cell-damaging free radicals. Dip a washcloth in diluted apple cider vinegar and apply it over sunburned skin to soothe the inflammation, cool down burning skin and minimize skin peeling. You can also pour half a cup of apple cider vinegar and a handful of colloidal oatmeal into hot bath water and soak in this soothing solution for instant relief. Apple cider vinegar contains anti-bacterial properties that help kill acne causing bacteria and germs. It can also soak up excess oils from within skin pores, reducing oiliness and keeping acne away. Mix 1 tsp organic acv with 3 tsp water to get a diluted solution. Add 2 drops of tea tree essential oil for its powerful anti-acne properties. 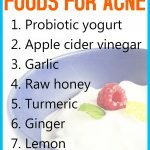 Soak a cotton ball or a q-tip in the diluted ACV and apply it to acne. Keep it on for 15 minutes and rinse with cool water. Apple cider vinegar is rich in powerful antioxidants including vitamin C and b-vitamins. Vitamin C stimulates hair growth by fighting off free radicals that steal oxygen from healthy hair cells. It also combats dandruff and improves blood circulation in the scalp, promoting hair growth. B-vitamins reduce hair loss by inhibiting dihydotestosterone (DHT), a hormone which causes baldness in both men and women. 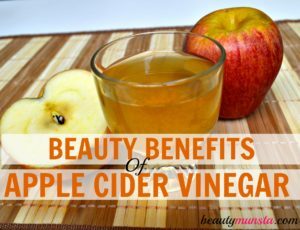 ACV offers amazing beauty benefits for luscious hair. It works by sealing the hair cuticle, which traps in moisture and reflects light off your hair strands. Dilute 1/3 cup of raw ACV with 2 cups of pure water and use it as a hair rinse after conditioning for fabulous hair! A wart is a cauliflower-like shaped bump on the surface of the skin. It is a viral infection, is really unpleasant and can spread to other parts of the skin if not treated well. Before you try out any remedy, first check with your doctor to see if the wart is cancerous. To remove a wart fast, soak a cotton ball with diluted ACV and press it to your wart, sticking it closer with a band aid. Continue this method every night until the wart turns black and falls off. It works because ACV is exfoliating and helps remove excess dead cells/superficial skin, thereby killing off germs and viruses breeding within the skin pores. Reducing the appearance of varicose / spider veins with ACV is not just an old wives tale – it really works! You can use it in two ways – by ingesting diluted apple cider vinegar, sweetened with raw liquid honey, on an empty stomach and applying the affected area with ACV using a soft washcloth. ACV helps by reduce varicose veins those spider veins by shrinking them. To use it topically, soak a washcloth in ACV and place it on the affected area. For best results, lie down and keep your legs elevated as the soaked washcloth does its magic. Because skin has an acidic pH, raw apple cider vinegar will help restore and maintain our skin’s natural pH. That means most soaps and cleansers, which are alkaline in nature, actually throw our skin’s normal pH out of balance. 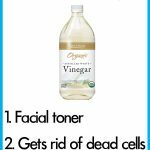 Make your own ACV facial toner by mixing 1 part raw ACV with 3 parts pure water. Add a few drops of lavender essential oil for its skin beautifying properties. Store it in an empty spray bottle and spritz away! Topically, raw apple cider vinegar acts as a natural astringent which tightens skin and helps shrink large pores. It is also antibacterial, which means it can kill of germs and bacteria on the skin’s surface. ACV’s antioxidant properties help keep free radicals and contaminants away from skin. Remember to dilute apple cider vinegar before using it on your skin. Dandruff is a scalp problem which is actually caused by yeast-like fungus, malassezia. ACV works wonders in eliminating dandruff because of its effective anti-fungal properties. Dilute 1/2 oz raw apple cider vinegar with 1 oz water then add 3 drops of anti-dandruff thyme essential oil. Store this solution in a 2 oz amber glass spray bottle and spritz it on your scalp before every shower. Apple cider vinegar contains ascetic acid, which is efficient in killing off lice and nits. 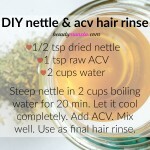 Make an ACV hair rinse by mixing spritzing your scalp and hair strands with a solution of 1 parts ACV and 2 parts water. Add a few drops of peppermint essential oil. Store in a big spray bottle. Shake to combine and start spritzing all over your scalp and hair till soaking wet. This will loosen the bonds between clingy nits and hair strands, which makes it easier and faster in combing out the nits. To completely rid your hair of nits, make an olive oil hair mask by soaking your entire head with olive oil. After doing this, put on a hair mask and leave it on for about an hour or two. Then wash off very well using liquid castile soap and warm water. Then go ahead and use the ACV spritz and rinse your hair thoroughly. Repeat this treatment after 2 days. Treat skin infections caused by fungi naturally with raw ACV. ACV is rich in antioxidants which assist your body to fight contaminants, irritants, free radicals and germs on skin. Yeast infections such as candida can also be effectively treated using ACV. ACV contains potent enzymes and the acidic content helps eradicate fungal and yeast infections. Drink 1/2 -1 teaspoon raw ACV in pure water on an empty stomach everyday. Bad breath may be caused by bacteria in the mouth, or even improper digestion. ACV acts as a detoxifier, cleansing the mouth and eliminating toxic substances and bacteria that produce bad odor. It will help purify your digestive system and eliminate bad breath. Drink 1/2-1 teaspoon of raw ACV mixed in a cup of pure water before every meal and on an empty stomach to keep your breath fresh. Did you know: This simple drink is also said to cure heart burn! Natural teeth whitening is considered controversial but many claim that ACV not only whitens teeth naturally but also kills mouth bacteria which cause tooth decay and cavities. In a small bowl, add in 1/2 teaspoon raw ACV and 1 tablespoon water. Dip in your toothbrush and brush your teeth with it. Remember to dilute raw ACV with pure water because using raw ACV alone will wear down your enamel, causing sensitivity. Use this at least once a week. Believe it or not, ancient Perisans used apple cider vinegar as a natural deodorant! Here are the reasons why you should too! Apple cider vinegar is an antibacterial and anti-fungal that will keep the sensitive skin of your armpits clean and germ-free. It will also naturally neutralize any bad odor. Mix 1 part raw ACV with 3 parts water and a few drops of lavender essential oil. Store it in a glass bottle with a stopper. 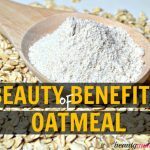 Apply this to your skin for fresh and clean skin. Don’t worry about the smell of ACV as the lavender will help mask it and even if it does smell a bit like vinegar, it disappears almost instantly. Product build-up tends to make hair dull and lifeless. ACV is a detoxifier that will remove build-up on your scalp. It contains ascetic acid, that breaks down tough product build-up and remove pore-clogging dead cells. Coupled with baking soda, you can make a total scalp treatment to remove buildup. To cleanse your hair, use diluted ACV and 1 teaspoon baking soda. Massage it onto your scalp for at least 30 seconds. Leave it on for 5 minutes and rinse off with tepid water. Since ACV is a natural astringent, it helps reduce skin oiliness by tightening skin and shrinking large pores. By doing this, acv checks over secretion of sebum from the oil glands. Large pores facilitate over secretion of sebum which can cause pimples, black heads and also white heads. Mix apple cider vinegar with water in the ratio 1:3. Store it in a spray bottle and spray every after shaving your legs, hands, armpits for a natural and soothing after shave. ACV works in removing blackheads by tightening skin and shrinking pores. When you topically apply diluted ACV on your face, it tightens up skin, enabling the black head to come out naturally. 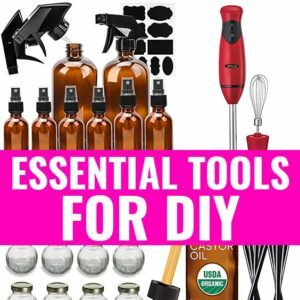 Make your own blackhead-extracting face mask using baking soda and raw ACV. Mix 1 tablespoon raw ACV diluted with water and 1 teaspoon baking soda. Apply this on your black head affected areas. After 10 minutes, rinse off. Repeat this black head treatment twice a week. Avoid the synthetic red apple cider vinegar found in most stores. This does not have the powerful antibacterial and antioxidant superfood properties of real RAW apple cider vinegar with the mother. The store bought ACV can actually damage your hair.